﻿ Activities in the Past Tanka Poet Mariko Kitakubo. Contemprary Tanka Poet Mariko Kitakubo. Activities in the Past. including 5 domestic international events. 20th, Japanese-English tanka reading at my best firend's home party in Montreal, Canada. 03rd, Bilingual tanka reading at an reading event of SAKURA Haiku Festival held at Tokyo Bunka Kaikan, Ueno. 02nd, Bilingual tanka reading at the Tujunga Library. 02nd, Bilingual tanka reading at Ms. K. Wilson's home. 01st, Bilingual tanka reading at the workshop held at Ms. K. Wilson's home. 01st, Bilingual tanka reading in Altadena, CA. 160th performance in 38 cities oversas. 30th, Bilingual tanka reading at the Scenic Drive Gallery Monrovia, CA. 29th, Bilingual tanka reading at Ms. Deborah P.Kolodji's home. 28th, Bilingual tanka reading at Ms. K. Wilson's home. 28th, Bilingual tanka reading at the Scenic Drive Gallery Monrovia, CA. 27th, Tanka reading at the Bolton Hall Museum, CA. 27th, Tanka reading at "Lunar New Year Festival" in the Storrier Stearns Japanese Garden. 3rd, Tanka reading at Chubu Nihon Kajinkai event, KOTEN-NO-HI, in Nagoya. 30th, Bilingual tanka reading at the Live Lyre event by Glass Lyre Press held at "BOOKMARKET" library in Chicago, U.S.A.
06th, Bilingual tanka reading at ANIMUSIC art event in Lisbon, Portugal. 28th & 29th, At Nick Virgilio Writer's House Opening Event in NJ, U.S.A, bilingual tanka reading & speech. 05th, At Japanese Canadian Cultural Center in Motreal (JCCCM) in Montreal, Canada. 04th, At spring memorial event of KAGENKI in Hiroshima. 04th, At Ms. K. Wilson's house. 03rd, At Sunland Tujunga Branch Library, C.A. 02nd, Friday Reading Meeting held at Ms. Kathabela Wilson's home. 01st, At the Storrier Stearns Japanese Garden, Pasadena. 31st, At Wednesday Reading Meeting in Pasadena. 30th, At Scenic Drive Gallery Monrovia, CA. 14th, At Hosei Univ. Fujimi Campus presentation & tanka reading "Communication Beyond Languages". 09th, At Café Lecture Les Augustes in Clermont Ferrand, France. 07th, At Momie Librairie in Clermont Ferrand, France. 06th, At Hirosima Memorial Event in Maruki Museum. 19th, At the Wednesday Poetry Meeting. 18th, At Kathabela & Rick Wilson's house. 16th, At the San Diego Poetry Annua at the Florence Riford Library Center in San Diego. 14th, At the poetry meeting in Caltech, Pasadena. 13th, At the Storrier Stearns Japanese Garden, Pasadena. 12th, At the Tanka California Meeting at Kathabela & Rick Wilson's house. 11th, At the Tanka Lovers Dinner Meeting at Kathabela & Rick Wilson's house. 07th, One more bilingual tanka reading after the meeting in Pasadena. 07th, Bilingual tanka reading at Caltech, Pasadena. 06th, Bilingual tanka reading at the Storrier Stearns Japanese Garden, Pasadena. 03rd, Bilingual tanka reading at Ms. S. Dobay's art gallery. 02nd, Today, I could do my tanka reading performance at Marienberg / University of Teacher Education St. Gallen Switzerland. It was my 120 times oversea's activity!. 01st, At Sekundarscheule, Goldach, a school in Switzerland. 04th, Bilingual tanka reading at "Nuclear Impact Broken Atoms in Our Hands", the event held at Allendale Branch Library in Pasadena. 01st, Biringual tanka reading at the WESTMONT of Morgan Hill. 26th, Bilingual tanka reading at Cha-ya in Monterey. 22nd, Biringual tanka reading at Ms. P. Machmiller's house in San Jose, California. 14th, St. Valentine's Day Evening of Poetry & Roses at Pasadena. 13th, Bilingual tanka reading at the meeting held at Ms. K. Wilson's house. 12th, Bilingual tanka reading, and "Rengay" reading at Ms. S. Dobay's art gallery. 12th, Bilingual tanka reading, and "Rengay" reading with Mr. Roger Abe at Ms. K. Wilson's house. 12th, Bilingual tanka reading, and "Rengay" reading with Mr. Roger Abe at Storrier Stearns Japanese Garden. 10th, AWP Book Fair event, "Nuclear Impact" at Renaissance WDC hotel. 13th, Scenic Drive Gallery Monrovia, CA. 09th, Friday Reading Meeting held at Ms. Kathabela Wilson's home. 08th, Storrier Stearns Japanese Garden. 07th, Reading Meeting held at Ms. Kathabela Wilson's home. 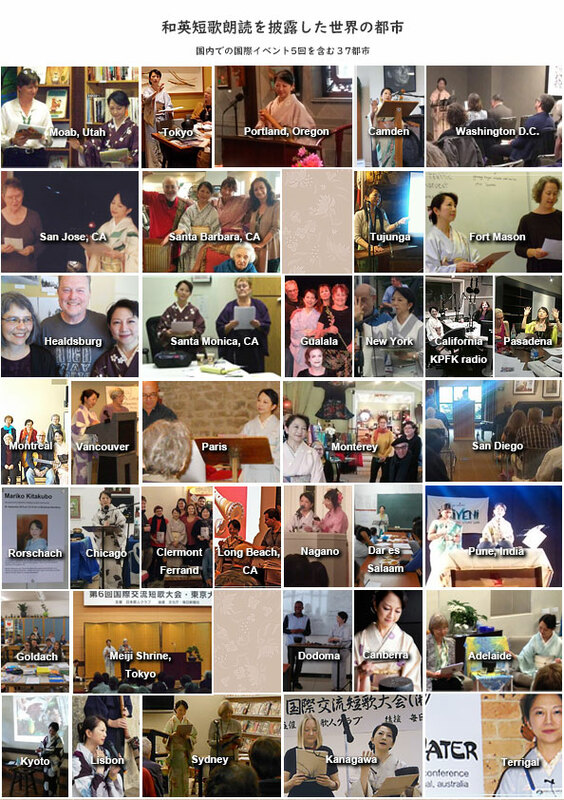 27th, bilingual Tanka reading at the Bolton Hall Musium, California. 22 to 25th, TRIVENI World Haiku Utsav 2016 in Pune, India. I was able to perform my 100th bilingual tanka reading in the international poetry events in India, which is the country I visit for the first time in my life　(150 performance sessions in total, including the reading performances in Japanese in the domestic events). Being mindful to stay healty, I would like to continue taking small steps to move forward frome now on. 03rd, Karuizawa Ryokuin Bungei Salon at Karuizawa Rodoku Kan.
05th, At the party on the night before leave for Japan. 04th, Storrier Stearns Japanese Garden in Pasadena. (on the same day) Poetry meeting at night. 03th, Wednesday Poetry Meeting in Pasadena. 02nd, Scenic Drive Gallery Monrovia in California. 31st, New York Petry Festival. 30th, New York Poets House. 28th, Thursday Poetry Meeting in Pasadena. 27th, Wednesday Poetry Meeting in Pasadena. 26th, First Presbyterian Church, Altadena, California. 24th, Village Poets of Sunland & Tujunga at Bolton Hall Musium in California. Nihon Kajin Club International Tanka Festival in Karuizawa. Bilingual tanka reading at Kyoto Sakaimachi Garo gallery. At Ms. Kris Moon's exhibition held at Gallery Cafe George. Four tanka reading sessions in Pasadena, CA, - Wednesday tanka meeting, Thursday tanka meeting, Storrier Stearns Garden, and Saturday Tanaka Poetry Party. One session Nursing Home in Santa Barbara, CA. HNA Tanka Sunday in Albany, NY. Moon Day's Reading in Pasadena, CA. Reading in Japanese/English/Vietnamese in Pasadena, CA. Rattle Reading Series in Pasadena, CA. At the reading event hosted by Ms. Deborah P. K.
Reading performance with Ms. Kathabela Wilson in Tsukuba. "Taste of Japan Poets on Site"
Tanka reading and interview at "KPFK Radio-LA 90.7FM"
TANKA reading at "Center Culturel Italien", in Quartier latin ,Paris, France. Reading performance in Paris in Sepember, 2013, was my 100th Tanka reading in total, and the 50th of presentation overseas and international events. I would like to extend my sincere gratitude towards all the audience and everyone who supported me to enable this wonderful achievement. Without their support it was not possible.I would like to continue making efforts, aiming at 100 presentations overseas. TANKA reading, a live broadcast, at Musashino FM. TANKA reading at FM TAMAN radio station. TANKA reading at the 7th International Tanka Festival 2012. TANKA reading at the moon viewing party, in the U.S.
TANKA reading at Musashino FM. "The 16th Peace & Antiwar Festival" in Itoman-city, Okinawa. TANKA reading at the Tamworth library. TANKA reading at Sydney (Beecroft). TANKA reading and photo exhibition at a charity event for the Great East Japan Earthquake reconstruction held at "Cafe KAZE NO EKI" in Mitaka-city Tokyo. TANKA reading at an English Tanka workshop in San Jose, USA. TANKA reading at the HPNC in San Francisco, USA. TANKA reading at the God's HR Cafe in Australian National University. TANKA reading at the Asian Book Room in Canberra, Australia. TANKA reading at "the 7th World Peace Appeal with Tanka" gathering. And I appeared on FM Taman, a radio station in Okinawa. TANKA reading at the Tea House Event in San Jose CA, USA. TANKA reading at Arches Bookstore, Utah, U.S.A.
TANKA reading at poetry party hosted by "Kurenai" magazine. TANKA reading at ARIRANG cenotaph in Tokashiki Island, Okinawa. I appeared on FM TAMAN from my house in Tokyo over the phone. TANKA reading at "Footsteps of Basho Tour", Akasaka, Tokyo. TANKA reading at an English-tanka workshop. TANKA reading at San Jose, California. TANKA reading at the opening party of Tea Room Chado, L.A.
TANKA reading at Japanese American National Museum, L.A.
"The 15th Peace & Antiwar Festival" in Itoman-city, Okinawa. TANKA reading at cafe & gallery "Figaro", Okinawa. FM Taman, a radio station in Okinawa. 4th week. FM Taman, a radio station in Okinawa. 3rd week. Bilingual TANKA reading at the 6th International Tanka Festival in Tokyo Japan. The 4th Haiku Pacific Rim "WIND OVER WATER" in Terrigal & Gosford, Australia. TANKA reading at the following three events. Bilingual HAIKU reading with Ms. B. George. English Haiku written by B.George/Translated by Kitakubo. Bilingual HAIKU reading with Ms. A. Fielden. Matsuo-Basho, Kaga-no-Chiyojo. Bilingual TANKA reading with Ms. A. Fielden. My original tanka works. Appeared on FM Taman, a radio station in Okinawa. TANKA reading with Ms. A. Fielden at Asia Bookroom in Canberra. TANKA reading at Ms. A. Fielden's workshop. TANKA reading with Ms. A. Fielden at Australia NationalUniversity in Canberra. TANKA reading With Ms. B.George at Ms. Julie Thorndyke's book launch party. TANKA reading With Ms. B.George at Gosford/Edogawa Commemorative Gardens in Sydney. Collaboration of Tanka, Shinto Flute, Dance and Hamohn atNoh Theatre in Tokyo. TANKA reading with Ms. Linga Galloway at Santa Monica College. "YUKI TEIKEI CONFERENCE" at Monterey, San Francisco. Reading with Ms. Amelia Fielden. TANAKA reading at Temporary Rehabilitation Hospital in California. TANKA reading at Haiku Poets Northern California workshop in Fort Mason, SF. 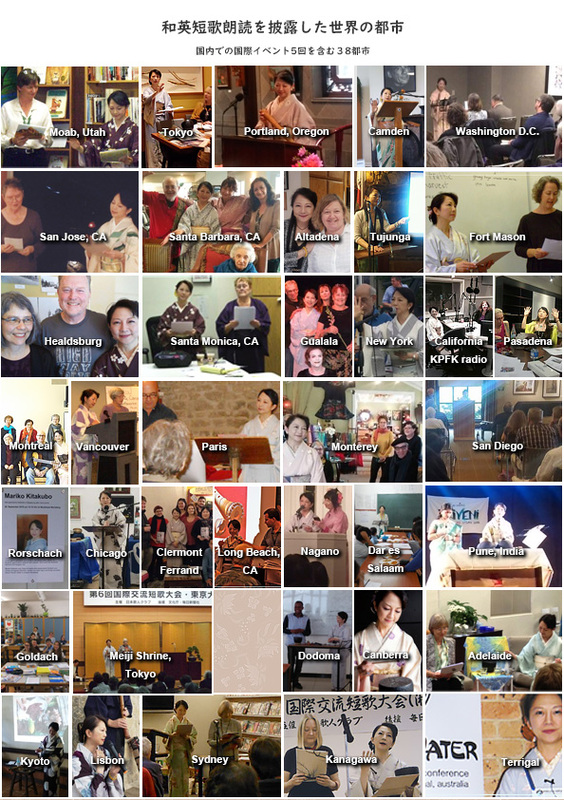 "YUKI TEIKEI CONFERENCE" at Monterey, San Francisco. Tanka Work shop in Sydney and Canberra. At the English Tanka workshop in Sydney at Ms. Amelia Fielden's house. At the workshop of first-ever Australian Tanka journal, EUCALYPT at Ms. Beverley M. George's house. “Haiku Tanka Festival in Vancouver” Tanka reading with Ms. A. Fielden. * denotes that events run by myself, from the planning stages and through-out the events.